Tuesday's first-round game in the Great Basin Conference girls' prep basketball tournament in Hailey had all the hallmarks of an upset special. Visiting was this year's Cinderella team in the conference, the Burley Bobcats—so young (2 seniors, 2 juniors, 6 sophomores) and so hungry after turning around last year's 3-19 doormat record to a 10-11 mark. Awaiting Burley were the defending GBC champion Wood River Wolverines (10-9), energized in the last three weeks by the return from injury of their floor general, senior point guard Kaitana Martinez. Could Burley upset Wood River? The Bobcats certainly could, judging by two previous clashes between the two—a 48-44 Wood River overtime triumph in Hailey Dec. 9, without Martinez, and a 59-53 Burley home win Jan. 17, Martinez playing her second game. Martinez (20 points, two 3-pointers, 4 rebounds, 3 assists) and senior post Haylee Thompson (7 points, 9 rebounds) led the way on a night when Burley's outside shooting was red hot, and Wood River's half-court offense was out-of-sync. 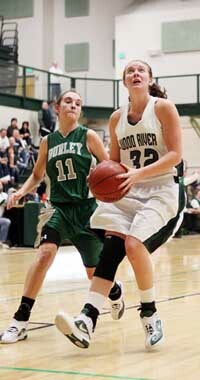 "Burley has given us our most competitive games of the season," said Wood River coach Kevin Stilling. "They get down the floor so well. But towards the end, I think we played with a determination to win, while Burley wasn't nearly as aggressive as they had been earlier." Wood River led 11-2 in the early going, after which the Bobcats sparked by the hot shooting of junior Aubrie Vale (11 points, three 3-pointers, 4 assists) embarked on a 17-4 run to assume a 19-15 lead. After that it was an uphill battle for the Wolverines, who kept regaining leads only to lose them to Burley's uncanny shooters. But, Burley's seven turnovers in the fourth quarter took a toll. Fueling the defense was relentless chasing and defense by senior Haillie Taylor (6 points, 2 rebounds, 4 steals, 7 deflections), who played a strong floor game. And Hailey senior Cheyenne Swanson (6 points, 4-for-4 free throws) led Wood River's 7-for-12 from the line in the final eight minutes. Unfortunately for Wood River, Swanson was whistled for a retaliation foul in the third quarter—a foul that incensed Burley rooters. The Bobcats provided video footage of the foul that was analyzed and, on Wednesday, Swanson received a one-quarter suspension to start Thursday's Wood River game at Twin Falls. Top-seeded Twin Falls (13-7, 8-2 league) hosted Wood River Thursday. No. 2 Jerome (14-5, 6-3) visited Minico (13-6, 7-3). If Wood River beat Twin Falls, the Wolverines would travel to the Jerome-Minico winner today, Friday at 7 p.m. If Wood River lost to Twin Falls Thursday, the Wolverines will host another game today, Friday at 7 p.m. against the winner of Thursday's loser-out game between Burley and Canyon Ridge (4-17, 0-10).